Habit: Subshrub 1--5 dm; caudex much-branched. Stem: unbranched proximal to inflorescence, brittle, rough, +- gray-hairy. Leaf: 1--3 cm, oblanceolate, 1-veined, flat, rough-hairy. 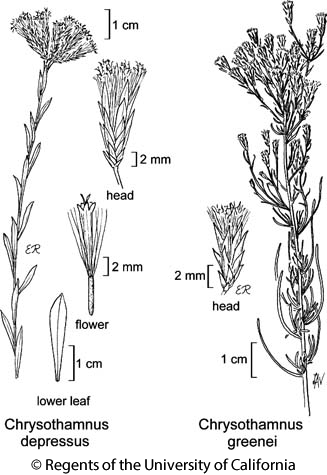 Inflorescence: heads in small clusters; involucre 9--15 mm, +- cylindric; phyllaries generally in 5--6 well-defined vertical ranks, strongly keeled, acute to acuminate, straw-colored or +- purple. Flower: 5--6; corolla 7--11 mm; style branches exserted, appendage generally +- = stigmatic portion. Fruit: 5--6.5 mm, +- cylindric, glabrous or with few glandular hairs; pappus +- = corolla. Chromosomes: 2n=18. Citation for this treatment: Lowell E. Urbatsch 2012, Chrysothamnus depressus, in Jepson Flora Project (eds.) Jepson eFlora, http://ucjeps.berkeley.edu/eflora/eflora_display.php?tid=2067, accessed on April 24, 2019. No expert verified images found for Chrysothamnus depressus.